Industry-first perspective on the fiber management and migration strategies of global CSPs and the impact that new fiber services will have on legacy BSS/OSS systems. Now more than ever, service providers are aggressively rolling out fiber to boost network performance, improve the customer experience, and offer new IP services such as Gigabit Internet, IPTV, 4K/8K video streaming, and business services. This growing fiber diet brings about new operational complexities, impacting existing back-office systems and the ability to launch and scale services quickly. 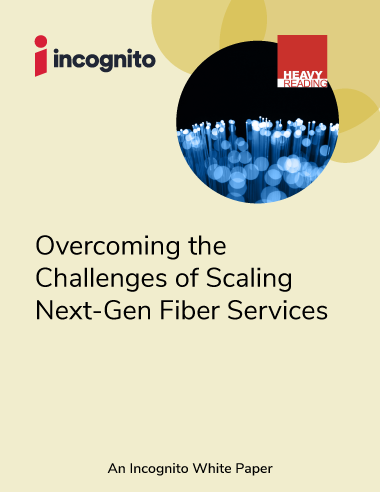 Incognito has partnered with Heavy Reading to produce a white paper based on the results of industry-first research examining the operational implications of supporting fiber services. The white paper explores service providers' network design and B/OSS strategies for supporting fiber-based services and offers regional analysis of fiber trends across the Americas, Europe, and Asia. Fiber services will have major impact on back-off systems – Service configuration and order management top list of impacted B/OSS systems.